A man who faked his wife’s suicide and was only caught after confessing to murder to a co-worker in the pub has been jailed for at least 17 years. 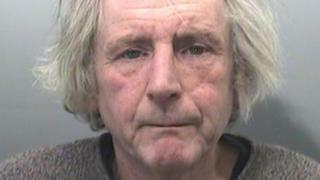 Derek Potter, 64, killed his wife Lesley, 66, at their Swansea home on 7 April and made it look like a suicide. Police did not treat her death as suspicious until, one week before she was due to be cremated, Potter told a colleague “I had to strangle her”. At Swansea Crown Court, Potter was given a mandatory life sentence. Mr Justice Soole said Potter had killed his wife in a “sudden furious burst of temper”. He said his decision to cover up the death as suicide had been a “shameful and despicable charade”, giving a “varying array of false accounts”. The judge added: “You murdered your wife of 26 years by strangulation as you held her down by the force of your body. “You then left the house in order to collect some money that was owed to you and to give you the opportunity to return home and purport to discover your wife’s hanging body. The court heard no suicide note was found by emergency services when they were called to the couple’s home on Hill Street, Mumbles, after Mrs Potter was found hanging naked in the couple’s workshop. Police did not initially treat it as a suspicious death and Potter said his wife had killed herself. But a week before his wife’s funeral, Potter took Natalia Mikhailoea-Kisselevskaia out to a Swansea pub after work. He told her his wife’s last words were “she still had a crush on a schoolboy she’d known years ago”. Prosecutor Paul Hobson QC, said the police response was “not in certain respects as it should have been” and “mistakes were made” – something South Wales Police has since accepted. Following the sentence, the victim’s family said: “Not only have we had to come to terms with the fact that he so cruelly killed our mother, but we have had to listen to him tarnishing her name throughout the investigation and court case. South Wales Police senior investigating officer Det Ch Insp Darren George said: “Derek Potter, Lesley’s husband, went to great lengths to try and disguise his horrific and callous crime, he remained confident up to his conviction that he could evade justice.